Raising two kids is a difficult job. And really expensive, especially when they are younger. We are talking double everything – cribs, diapers, toys, clothes, strollers etc. Here, we will focus on that last thing – double strollers. And we will take a look at the best cheap strollers you can get. Generally, high-end strollers even for one child tend to be pretty expensive, and not to mention how high the prices of double strollers go. Which does not mean that you can’t get a good stroller at an affordable price tag – you certainly can, and I will show you what your best options are in this detailed review. 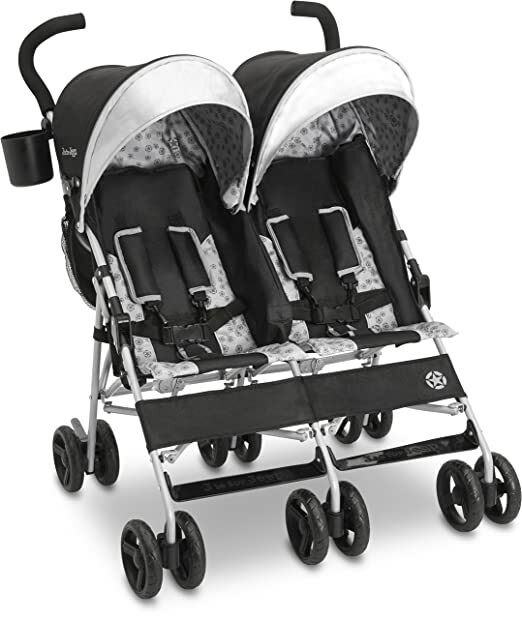 There are several different types of double strollers. You have regular double strollers, which have two front seats next to each other that are exactly the same. These are great for twins or kids that are pretty close in age (up to 2 years), as they will be able to use it longer. Then you also have double strollers which feature on seat on top or in front of the other, with the possibility to turn the seats so that they can face each other. 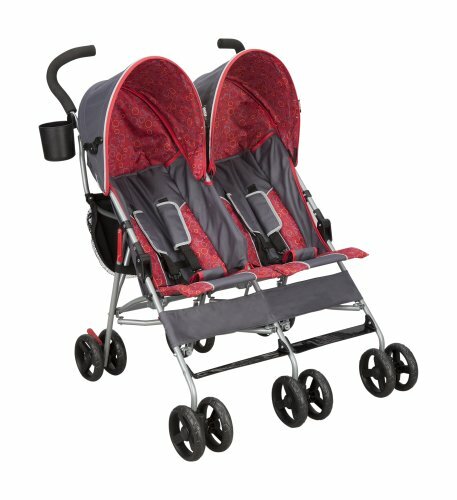 Sometimes the seats on these double strollers will have different weight capacities, so these are great if you have kids that are not that close in age – 2-3 years. And then you also have tandem strollers that have a front seat and a back seat. The back seat is usually intended for older children, and it can be used for both sitting and standing. Keep in mind that these types of strollers usually require your older kid to be standing on the back seat, if your younger kid is in the front seat. And as such, they are the best choice if you have kids that are a little further apart in age – 3-4 years. Basically, you can get any type of stroller you like. 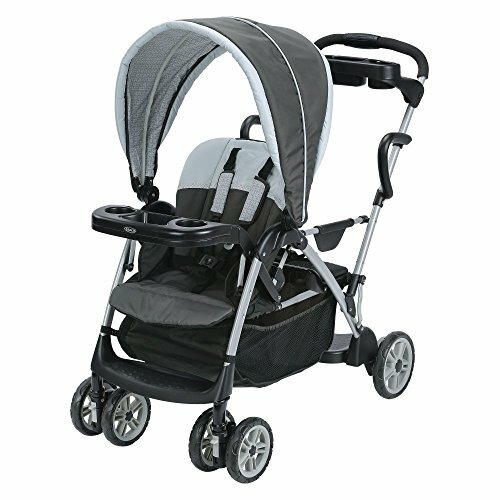 These are just my recommendations if you want to get the most use out of the stroller, and get the best value for money. Because, if you get a stroller that your older kid is going to outgrow in a few months, you are not really getting your money’s worth. And you’ll wind up having to buy an additional stroller, and in the end spending more money than you planned to. Everyone has a different idea of what cheap is. Some will find a $150 double stroller to be a bargain, while other will find it to still exceed their price range. With that in mind, I have selected only strollers that are under $200. 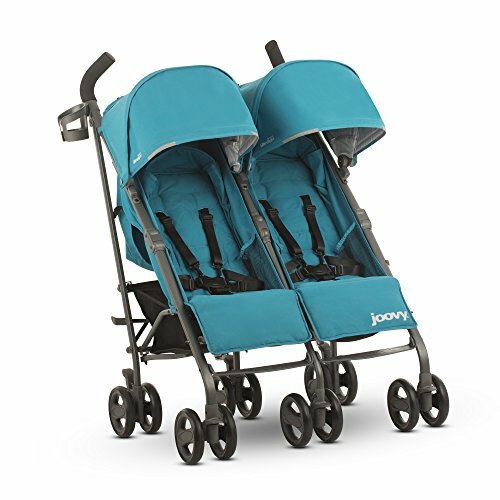 I will list them in this review in ascending order – we will start will the most affordable double strollers (under $100), and then we will gradually move on to those that are slightly more expensive. I bet this is your biggest concern – is it safe to buy a cheap double stroller? Well, if you pick one of these ten I assure you it is. I’ve gone through dozens of different double strollers on Amazon, and I’ve selected only these ten because they have the absolute best reviews. With hundreds of parents praising them and recommending them to other parents, I am more than confident that these will be safe for your child. A low price tag doesn’t always mean low quality. You absolutely don’t have to spend north of $400 to get a decent double stroller, and that’s what I’m going to prove to you in this review. This is a stroller for twins, or kids that are really close in age. The maximum recommended weight capacity of each seat is 35 lbs – so kids that are up to 3 years old. And this is an umbrella stroller, so it’s lightweight, compact to store and really great for travel. The Delta Children LX weighs approximately 19 lbs. It features reclining seats and a European-style canopy. Which will provide some protection to your kids from the sun, but not too much – I definitely suggest you invest in a different canopy if you plan to use it in sunny weather. And keep in mind that this stroller is not suitable for infants – the minimum weight requirement, according to the manufacturer, is 25 lbs. Which is the average weight of an 18-month-old baby. The 5-point harness will keep your kids safe while they are in this stroller, while the swivel wheels will make it easy for you to manoeuvre it through the streets. Additionally, double seats also mean double storage, and you get two hanging storage bags on the back of the stroller for your necessities. Overall, this is a good and affordable double stroller for travel, but not really the best for everyday outings. 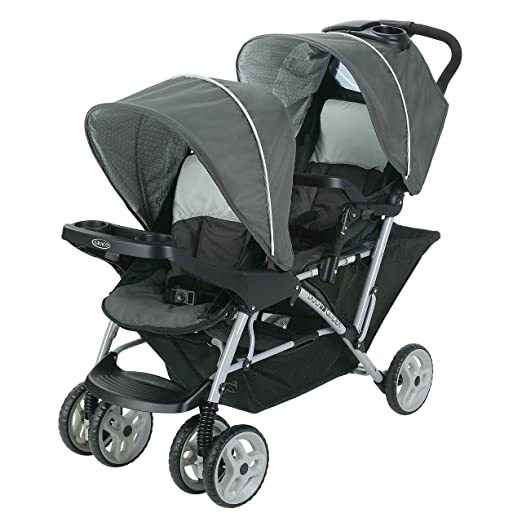 This particular double stroller is one of your best choices for travel. It is remarkably lightweight – just about 18 lbs. Which makes it a great choice if you are looking for a travel stroller. The seats of the stroller recline a little, but definitely not enough that you’ll be able to put your children into a sleeping position. But that’s not a big surprise, since this is an umbrella stroller. One downside of this stroller is that you won’t be able to use it for too long – 2 years max, and that’s if you start using it with your one-year-olds. Now, there are plenty of other strollers in this review that you can use for up to 5 years, which I think is a much better value for money. But if you are okay with this, and simply need an umbrella stroller for the occasional trip with the twins, then it’s fine. 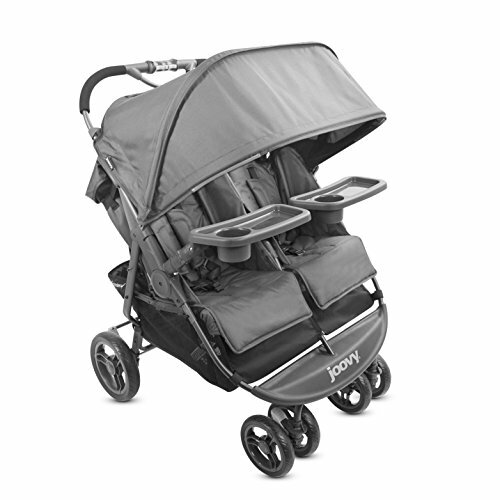 The canopy on the Scout stroller is a good size – it is not too large, but it is definitely larger than what you see on most umbrella strollers. However, that’s pretty much it for the cool features – there is no child tray, you get very little space for your gear and you don’t even get a parent organizer tray. You do get a single cup holder, which is okay I guess, but not really impressive. The Caboose stroller is a great choice if you have an infant and an older kid. It has a front seat and a back seat, both of which have a maximum weight capacity of 45 lbs. And it comes with a car seat adapter, which means that it’s compatible with all the popular brands. However, when the car seat is mounted into the front seat, there’s a good chance that your other kid won’t have enough space to sit in the back and will have to stand instead. A cool thing about this stroller is that you can get an additional Caboose rear seat, which transforms the back bench into a comfortable, reclining seat. But that’s optional – the back bench is pretty comfortable itself, and if you have an older kid I’m pretty sure they will love it, since the choice between sitting and standing gives them a sort of independence. 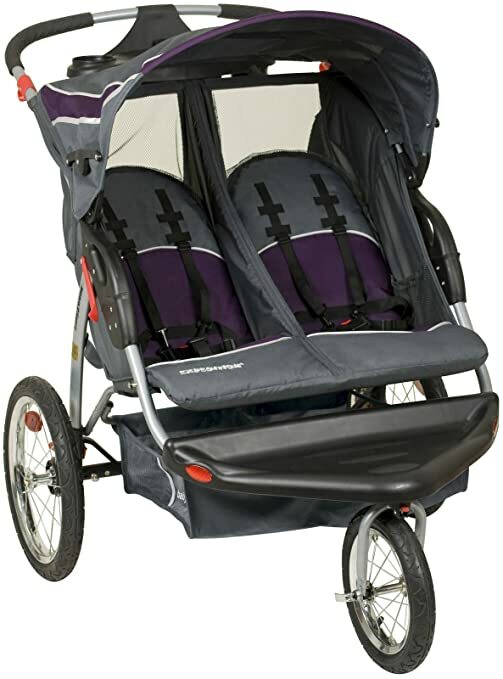 The canopy is pretty large, and you can even adjust it so that it covers both the kid in the front and the one in the back. But, keep in mind that this stroller lacks a parent organizer tray, so you won’t have all your on-the-go necessities handy. And with the pretty small basket under the seat, you will definitely need to bring a bag. The Baby Trend tandem stroller is a great choice if you have kids who are little more further apart in age. It has several seating options for your kids – you can put your infant into a car seat or directly into the stroller seat, while your older kid sits or stands in the back. But, you also have the option of mounting the car seat to the back seat, while your older child sits in the front seat. 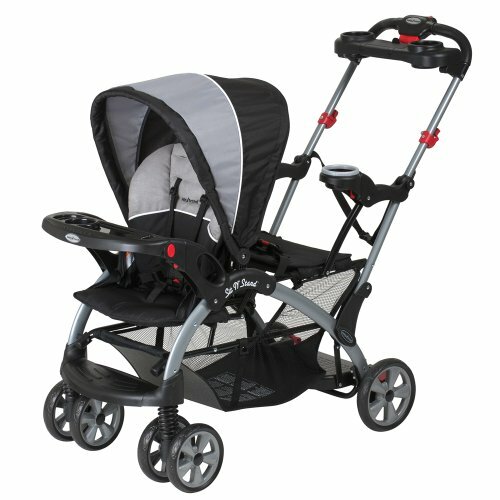 Now, this particular stroller is an affordable choice because it is compatible with a variety of car seats (SS66XXX). And if you are on a budget and can’t afford buying an additional car seat, then this is definitely the better choice for you. It’s not a stroller for twins, but you can use it with infants, as well as 5-year old kids, so it should last you a long time. In terms of the practicality of use, the stroller is equipped with both parent and child trays that can hold drink, food and toys. Additionally, there is a large basket below the main seat that can hold plenty of your gear. The swivel wheels and the parking brake make it easy to manoeuvre, and the safety harness will keep your little ones safe. The only thing that I think could be improved on this stroller is the canopy – it’s not as big as it should be. The DuoGlider stroller features two seats – one in front of the other. The rear seat is slightly higher than the front seat, so that even the child in the back has good visibility. Now what’s really interesting about this stroller is that is actually suitable for kids that are up to 3.5-4 years old. The maximum weight capacity of each seat is 40 lbs, and it’s even suitable for infants. But you will need to use a car seat! Put the baby in the car seat, and then connect it to the seat of the stroller, while your older kid rides in the other seat. That’s pretty awesome, right? But there’s a catch – the stroller is only compatible with specific Greco seats, so you would have to own one of those as well. And if you have really young twins, you will be able to use this particular stroller for years. Each of the seats is equipped with its own canopy, as well as a removable child’s tray. The swivel wheels have the option of being locked, which is a really useful feature. And, in terms of your own convenience, the stroller features an extra-large storage basket, as well as a parents’ tray that includes two cup-holders. Overall, this is a pretty good choice if you are looking for an everyday stroller. 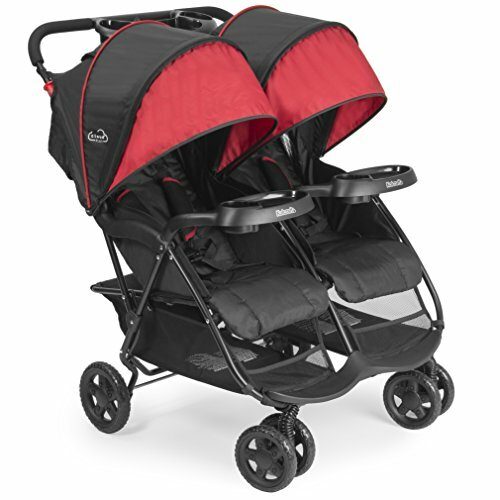 ­­­­The Kolcraft double stroller is a great choice if you have twins, or kids that are really close in age. Each of the seats can hold up to 40 lbs, and the recommended age of your children for this stroller if from 6 months to 2 years. It’s a jogger, so it is suitable for everyday use and you will get enough space for your gear – there’s a basket below each of the seats. As for the safety of your kids, the 5-point harness system will keep them pretty safe and snug inside the seats. And the canopy is 3-tier, so you will be able to adjust just how much you want to protect them from the sun. There are also trays and drink holders for both the kids, as well as the parents, and the seat reclines to several different positions so that you can make your kids as comfortable as you want. What’s really great about this jogger is that it is actually pretty compact when folded. So, if you are looking for a stroller for travel but need something larger than an umbrella stroller, this is a good choice. The only downside of this jogger is that the brakes are slightly awkward – you can’t really engage them with your feet. You have to bend down and flip them with your hand which is a drag, but they work well when engaged. So, most of the joggers that we checked out so far come with tiny double wheels. Which is fine, but which makes them really unsuitable for any off-road adventures. But not this Baby Trend Jogger – it has large bicycle tires, that will perform well even outside the city. 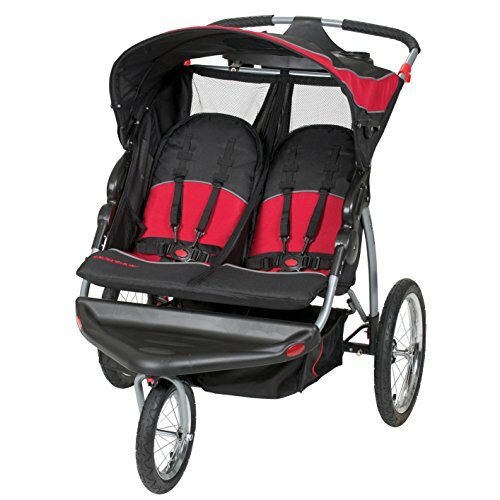 So, if you were looking for a double jogger stroller for hiking or picnics with your kids, I’d say this is your best option. 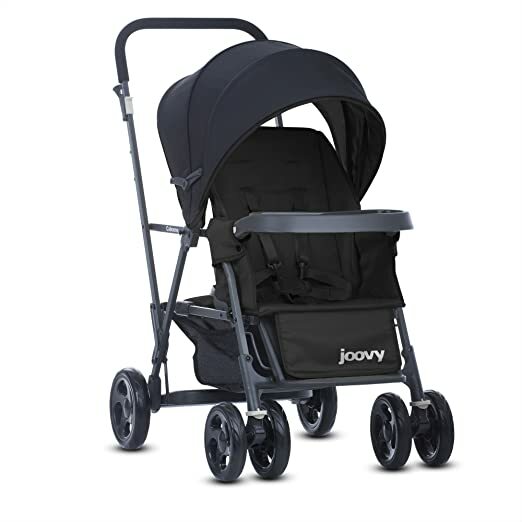 The wheels are also locking swivel wheels, so you will also have good manoeuvrability of the stroller. Additionally, the 5-point harness will make sure your kids are safe, even though there’s no handle bar or tray that they can hold on to. The one thing I don’t like that much on this stroller is the canopy – it’s one large shade that covers both kids, and you can’t adjust it for them individually. But in terms of your own convenience, the Expedition Jogger does not disappoint! The parent tray includes two cup holders and a small storage compartment, and you also get two large baskets under the children’s seats. Oh and there are also a couple of slip pockets on the back of the seats, which is pretty great! 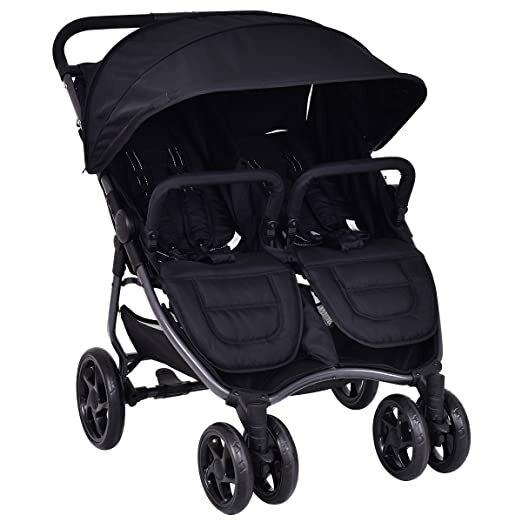 Overall, I’d say that this is a pretty good find – strollers that are similarly designed can easily set you back $500-600. And you can get this one for less than a third of that. The Groove is one of my favorite umbrella strollers so far. It is great for twins, but you can also use it with older kids, since the main capacity of each seat is about 50 lbs. And since the seats recline to a near-flat position, you can even use it with newborn babies. Overall, you will be able to use this stroller for a while, provided you get it while your kids are still pretty small. And you know what I really like about this stroller? Joovy actually included a strap that allows you to carry this on your shoulder when it’s folded! I mean, how convenient is that? And since it weighs only 26 lbs, it won’t feel too heavy when you’re carrying it like this. But granted, it could definitely stand to lose a few pounds, to be the ultimate double umbrella stroller. In addition to that, each seat has its own canopy, which is pretty large and features a peek-a-boo window. And on the back of the canopy you get a mesh pocket, a zippered pocket, as well as two baskets below the seats. Overall, this is one of the few umbrella strollers that actually has a bunch of different features! Granted, it’s not as cheap as some of the others, but it is still pretty affordable. The Costzon stroller is probably the best-looking stroller out of the bunch. If you want to look stylish while you’re out and about with your little ones, then this is the top choice. But you won’t get it because it looks sleek – you’ll get it because of convenience of use, reliability and the fact that it ensures the safety and comfort of your kids. Let’s talk about that last aspect a little bit. For one thing, the wheels on this stroller are lockable, and you won’t ever have to worry about it gliding away from you. The 5-point safety harness and the swivel handrail will keep your children in place all the time, and the reclining seat will keep them comfy all the while. Of course, the handrail is removable, so the stroller can kind of grow and transform as your babies do. The one thing that I think could be improved on this particular stroller is the shade. It’s a single shade – you won’t be able to adjust it individually for both your kids. But I don’t think that’s too big a deal, unless one of your kids is significantly older than the other. In terms of how compact this stroller is, all I need to tell you is that it locks once folded, and you can store it in both upright and lying position. So, this stroller is actually a rare find. It usually costs way more than $200, but it’s currently discounted about 30%! And if you want a stroller that is packed full of features but is still affordable, then definitely go for the X2. For one thing, the storage basket below the seats is huge, and I’m not even exaggerating. Not only will you be able to fit all the necessary gear in it, but you also get a couple of side pockets for some extras. The seats of the stroller are comfortable, recline to a near flat position, and feature a 5-point safety harness to keep your little ones in place. Plus, both seats can be adjusted individually, and so can the footrests. The only thing that you might not like is the fact that the single canopy covers both seats. But at least it’s pretty large, and it will definitely protect the kids from those nasty UV rays. And with the wide handle bar, the kids will have something to hold on to. 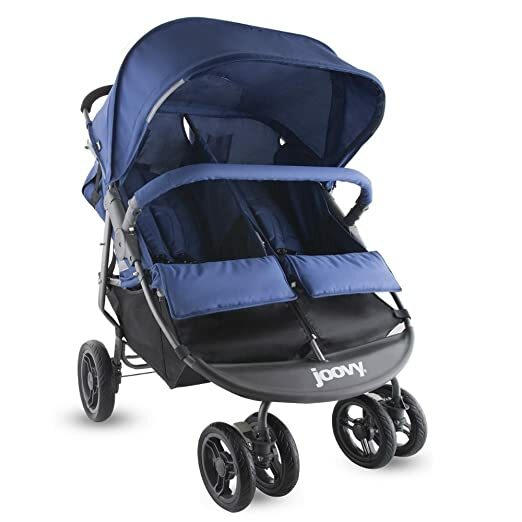 Overall, this is probably one of the best jogger strollers you can get – it’s extremely well designed, it’s both comfortable and safe, and just convenient for the parents. If you want to get a luxurious stroller at an affordable price, don’t miss out on this one! All 10 of the strollers I told you about are affordable and have dozens and hundreds of positive reviews. In that regard, whichever one you buy you will not be sorry. So, I’ll only tell you what my favorite ones are for each type. My favorite double jogger is the Baby Trend Expedition. That’s mostly because I was a little bit shocked to actually see the price of this stroller, since most others that are even remotely similar to it cost about twice as much. It’s an awesome off-road stroller, and it has everything to make both you and your kids happy. The only thing I would change about it is the canopy, but you can easily do that yourself. In terms of umbrella strollers, I have to recommend the Delta Children XL. That’s simply because it’s the most affordable out of them all – it pretty much costs less than a high-end make up palette. And it’s lightweight, compact, and easy to manoeuvre around – everything you need out of a good travel stroller. 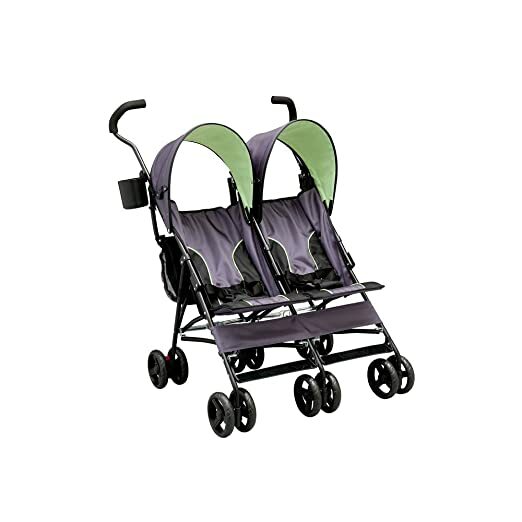 Now, both of those strollers are suitable for twins, as well as kids that are somewhat apart in age. But if you have a newborn baby and, say a four-year old, I would suggest you invest in a tandem stroller that has a standing spot in the back – like the Baby Trend Sit N Stand. Your older kid can choose whether to sit or stand on the bench, which will make them feel a little more grown up. And the best part about this stroller is that it’s compatible with a variety of different car seats! Those would be my top three choices. But you should definitely get the stroller that you think is the best fit for you and your kids. So, head over to Amazon to check out the prices of these strollers; I wasn’t lying when I said they were really cheap!